Every year I try to keep the pile down, and every year the stack of holiday reading jes' keeps on growing. And it doesn't help that buying Kindle books is so damned easy! So, what's on your reading list this year? Oh yeah, Clive James' Dante. Supposed to be a hist-hot translation. You concur, sir? You must either have extraordinarily long holidays or be a speed reader, Ulysses took me about 3 months, but then again I'm probably a little slow. Don't be naïve Craig; he doesn't actually read all these. 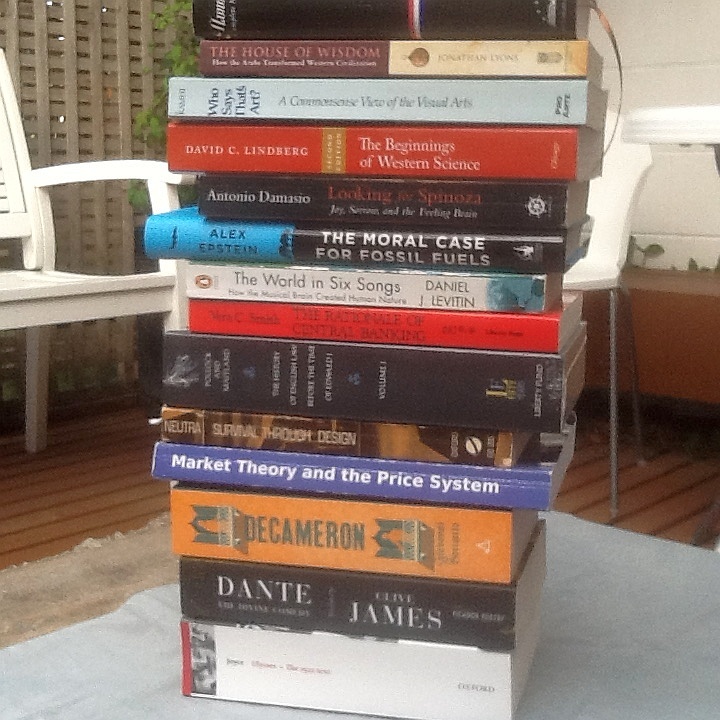 The photo of the book pile is there to give that extra intellectual pretension. Yeah, last week my actual library burned down--which was a real tragedy because both books were lost. And I hadn't even coloured one of them in yet. Have an excellent holiday season Peter, and thanks (as always) for another year of fantastic and provocative content. Thanks Greg. Have a great one yourself!